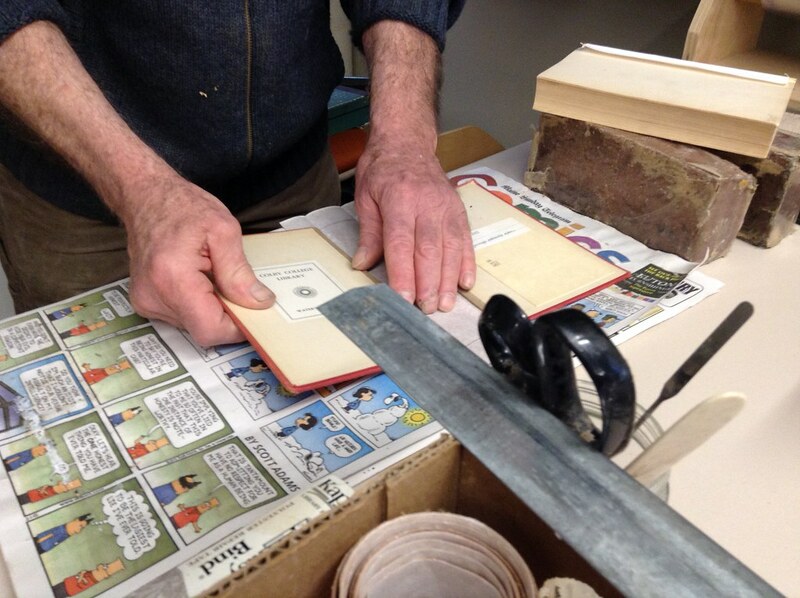 We’ve talked about craft bookbinding, but how do people repair existing books? Luckily, I have more experts at hand who are willing gullible enough to let me photograph them as they Do Things With Objects. 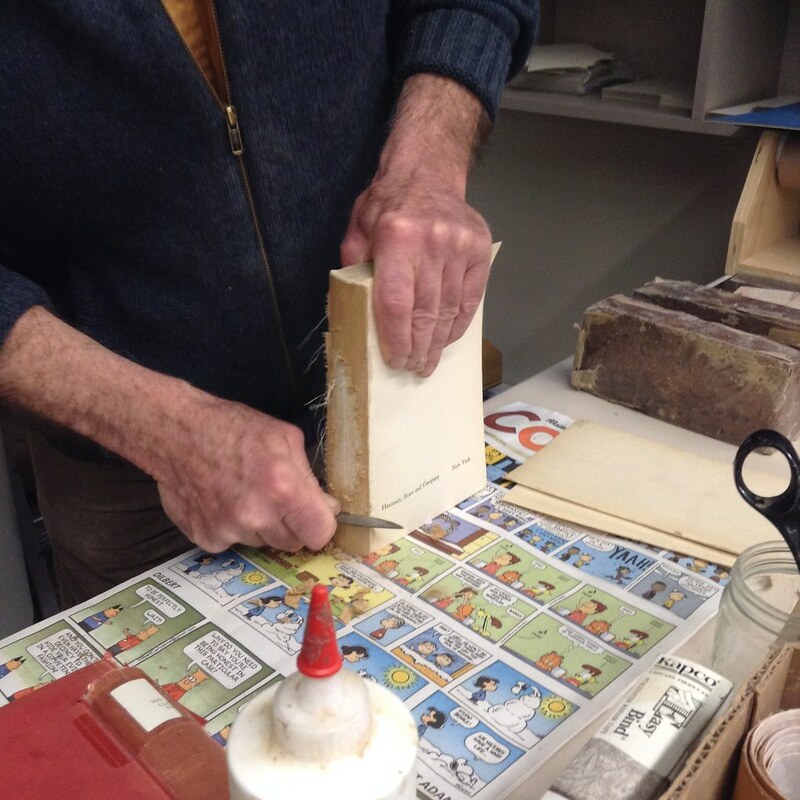 In this week’s object lesson, Chuck, a retired librarian in central Maine, shows us how to replace the cover on worn books. I didn’t exactly write detailed notes, so just, uhh… trust me on the details! 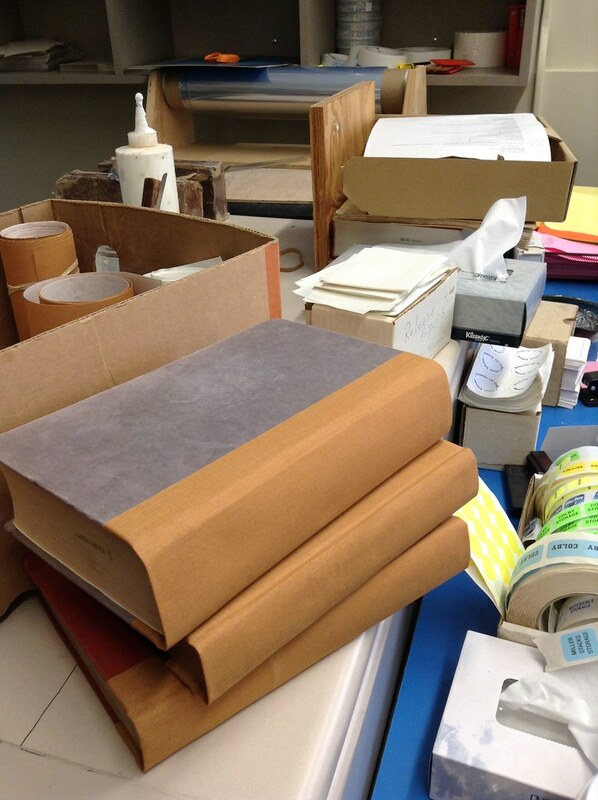 Maybe you have books with covers that are falling off, or crumbling at their little cardboard corners. Maybe when you open it, the cover kind of lolls to the side, or it’s so tight that it doesn’t sit straight on a shelf. 2. Pull off the old covers. 3. Scrape off any old glue. 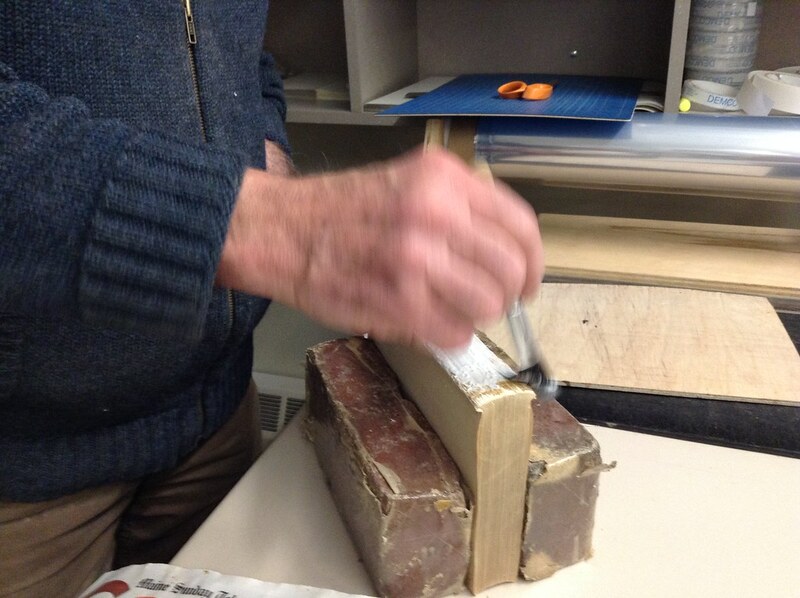 Here, Chuck gently scrapes any leftover glue and mesh fabric from the spine, keeping the binding intact. 5. Piece together a new–or upcycled–cover. 6. Attach the cover to the book. I don’t have images here, as I was asked to actually help (!). 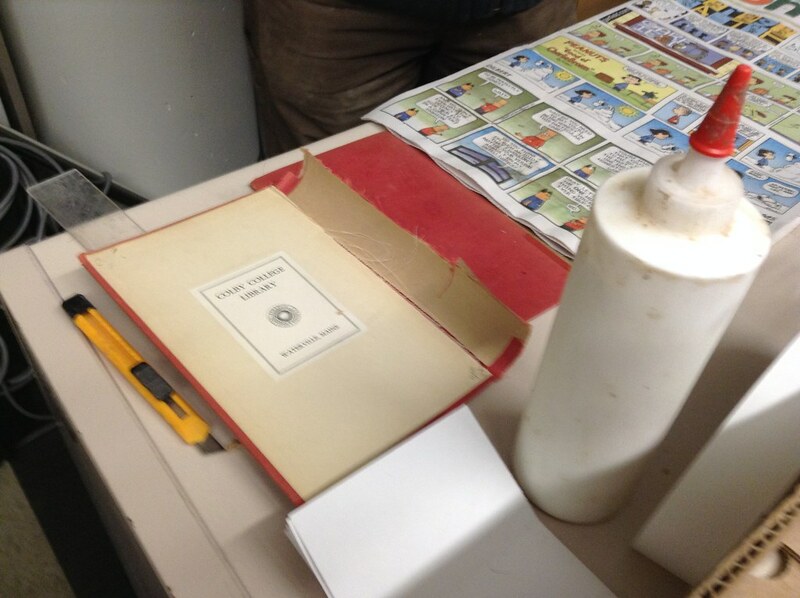 You’ll put endpapers on each side of the text block, and glue those to the interior of the new book cover. The result? A stack of freshly-bound books. The text inside is the same, and maybe even the boards that guard the text. The new binding is stronger, and will protect the pages from tearing and rumpling. 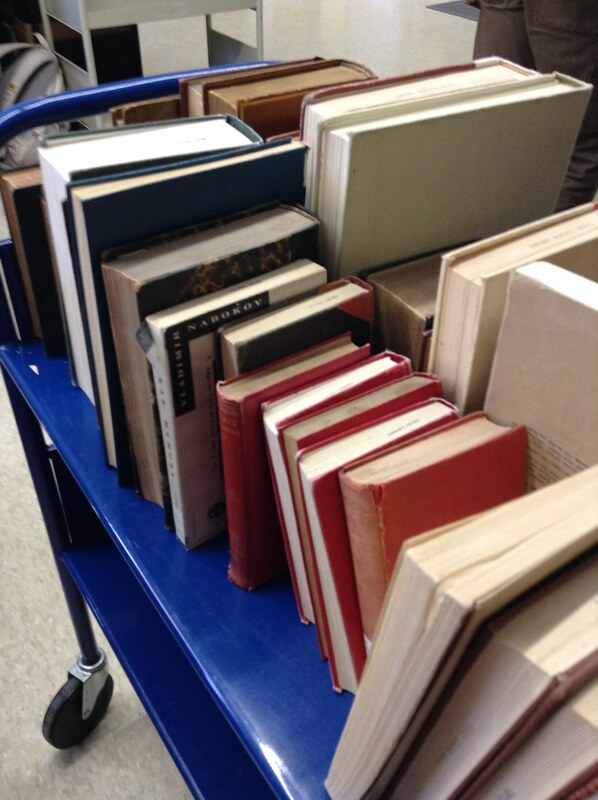 Chuck adds new labels, and then the books go back on the shelves. As if that’s not enough, Chuck is also a talented carpenter. 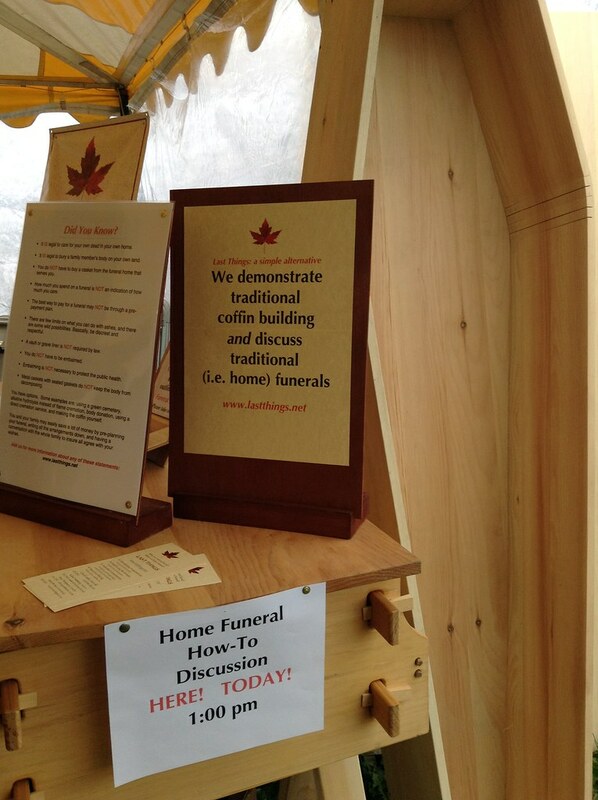 He makes and sells wooden coffins that can double as a bookcase until you die; the image below is from his booth at the Common Ground Fair held every autumn in Maine. Quite a macabre, if economical, two for one: a place for your newly bound books, and a nice little memento mori for your living room.